Steve Hansen insists that the British and Irish Lions should have arrived in New Zealand 'at least a week' before their first tour outing next Saturday. New Zealand head coach Steve Hansen has questioned the British and Irish Lions' choice to arrive in the country less than a week before their first match. Warren Gatland's men are due to arrive on Wednesday, three days before their first warm-up against the Provincial Barbarians XV in Whangarei. 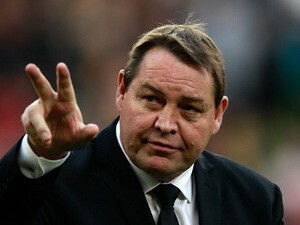 The Lions do not face New Zealand in the first of three Tests until June 24, but Hansen insists that he would have taken the decision to arrive with more time to prepare for the overseas trip. "You'd want to be there a week at the minimum [ahead of the first Test]," he told The Times. "It's nicer to be longer than that. When we tour we have total control over when we leave the country. "If most of them are not playing, what's stopping them getting on a plane now with most of the squad, for example? The option you've got is for the sake of the team. "We'll get over there and we'll see [the rest of] you when you get here. What they are asking them to do is pretty difficult, get here Wednesday, play Saturday." The Lions, seeking a second Test series triumph over New Zealand since 1971, will play 10 matches during their latest tour. Peter O'Mahony to lead Lions in first TestRead on course for first Lions TestGatland: 'Lions continually improving'Gatland: 'Warburton fighting for Lions spot'Gatland: "We squeezed the life out of them"
Live Commentary: Northern Ireland 1-0 New Zealand - as it happenedTeam News: Tom Flanagan handed Northern Ireland debutSteve Hansen questions Lions tour scheduleReid ruled out of Confederations CupNZ manager in frame for Norwich job? Messi unhappy with Deulofeu return? Milner wants to "hit the ground running"
Buy-back clause included in Traore deal? Terriers face legal action from axed coach?